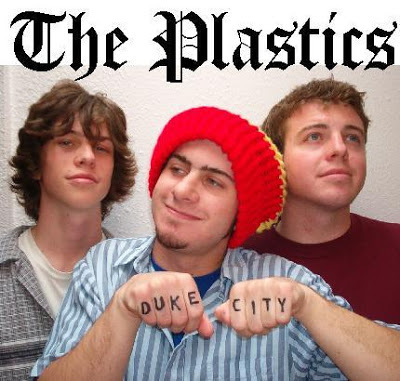 Divett, middle, in his band The Plastics. He might look like an ordinary project manager, but outside of school, Brennan Divett lives as a hip-hop/punk drummer. In Divett’s lifetime, he has been in a total of five bands. He started playing the drums when he was 14 years old, and acquired a drum set shortly after. His first band, called Friction, started two weeks after he got his set. From there, he joined the band Pre-Packaged Meat (PPM), then later The Plastics, Avenge Apollo, the BC Funk Xperience, and is currently working on a solo project. 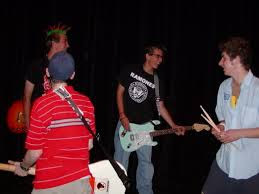 As a high school student in a band, Divett said he was busy. Still living with his parents, they imposed strict rules about when he could play the drums; he was only allowed to play for one hour maximum, and not after eight o’clock. Divett said the members of his second band, PPM, were “slackers” and would often wait until the last minute to practice, and they didn’t learn their parts. “The day before the show we would pretty much practice all day until I literally had blisters on my fingers. There were times where we practiced eight hours at a time, until the cops got called on us, or until the flesh was falling off our fingers,” he laughed. Divett, right, drumsticks in hand. He made a total of 4 full-length records and a couple of EPs, which are smaller albums. Out of those records, Divett said he wrote several of the songs himself. One was for The Plastics; the song was called “Do you want some nachos?” The other was for Avenge Apollo, called “Bloody Snow,” which he said is about “pioneers crossing the plains and walking so long that their shoes disintegrate, but they keep walking until their feet bleed and you can see the tracks of blood in the snow.” The song has a suprisingly upbeat tempo for such a depressing subject matter. Eventually, traveling for shows got in the way of Divett being a family man, and his day job made it more difficult for him to stay out all night.